Today- Tuesday (Sept 16th) 30 limited edition artworks by artists PURE EVIL, MYSTERIOUS AL, PMH, NICKY CARVELL, GOLDTOOTH & SUPERSTEVE will appear in & around London's Soho Square. Get yourself along to Soho and if you find one of them, not only do you get to keep it but it will also guarantee you free VIP entry to the SUPERSUPER London Fashion Week Party in association with Firetrap later this evening at Punk on Soho Street. What you'll be looking for are thirty ceramic gnomes (yes, gnomes), each one is 30cm high, and they will be placed in amusing, relatively easy-to-find spots around Soho Square, London W1. Each of the artists listed below worked on ten gnomes each, making this a very limited edition project. The gnome character, known as 'Deadly', is the Firetrap mascot and has been reworked in each artist's inimitable style. PURE EVIL: Inspired by skateboard culture and a ten year sojourn in California, Pure Evil picked up a spray can and began painting weird fanged bunnies virtually everywhere. Pure Evil is now launching his vision of darkness on an unsuspecting world. Beware. MYSTERIOUS AL: Trained as a fine artist, Mysterious Al now uses monsters, mutants and sub-human characters in a unique form of illustration. He has exhibited across the globe and has worked with diverse clients including The Big Issue, Orange and The Scratch Perverts. PMH: With solo shows including Peel Slowly And See and Minor Threat, PMH has worked with the label Stick It, and created windows for Lee. His work incorporates photographs, zines, collages, drawing and anything else he can get his hands on. NICKY CARVELL: Super hot new 'post pop' artist whose work is the dark side of dayglo, mixing pop icons (Kurt Cobain,East 17,Courtney Love) with colourful horror. Most recently shown in the 'Mash-Ups' show curated by Stuart Semple, and '3AM Eternal' at the Louise T Blouin Foundation, London. GOLDTOOTH: Michael Mantiss work captures the capricious spirit of the East End art scene. Founder of mayhem driven design duo Goldtooth he has been the focus of numerous shows. SUPERSTEVE: Artist, Founder & Creative Director of SUPERSUPER Magazine and curator (most recently of 3AM ETERNAL show with artists including Nan Goldin, Wolfgang Tillmans, Mark Leckey and Julie Verhoeven). 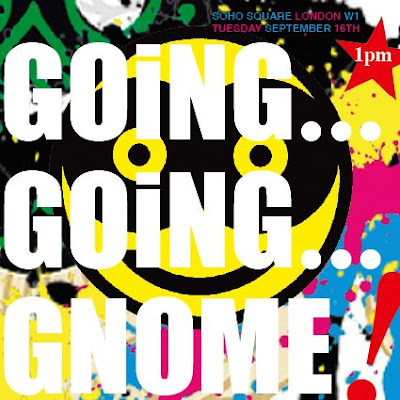 The gnome hunt kicks off at 1pm in Soho Square, don't miss it.